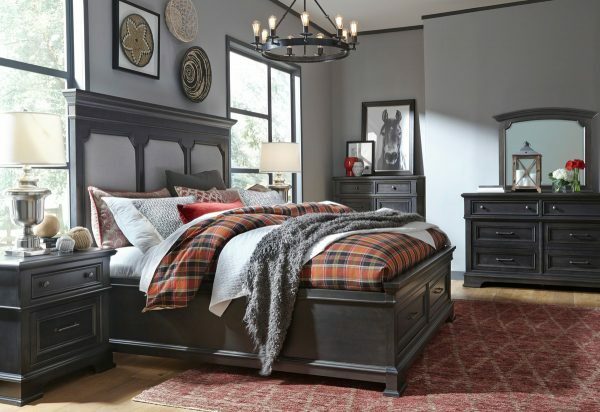 A collection of inviting pieces that capture rustic transitional design, Townsend, will feel comfortable in almost any home. Features such as canted corners; heavy moldings and ebonized maple inlays add the right amount of classic design, while the finish and hardware give it a casual tone. Functions like outlets with USB ports, storage footboard options, pullout shelves and wine storage add modern conveniences to Townsend. Crafted of select hardwoods and Rustic Birch veneers in a Dark Sepia finish with Gunmetal finished knobs and pulls.